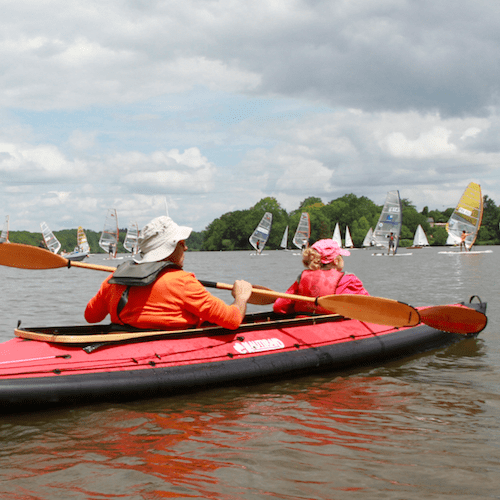 The two person Grand Raid model kayaks start with the 500, shown here with the optional downwind sailing rig. They can be specified anywhere from aluminium frame and PVC skin up to a wood frame with Hypalon skin with further options to add spraydeck, rudder, etc. See Accessories for all kayak additional options and extras. – Grand Raid 500 The bigger sister of the Raid 460 folding kayak model is better suited to larger paddlers and/or carrying more gear; will also be a little faster with the same load. 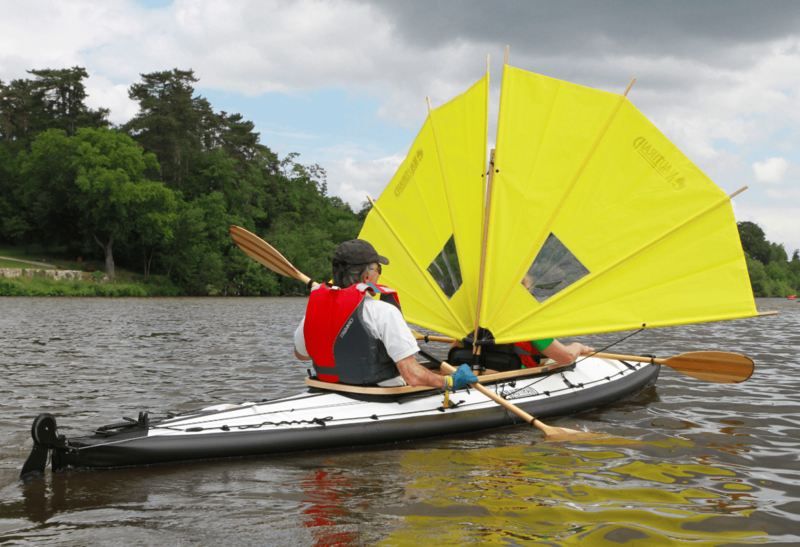 The aluminium version of this kayak fits into one bag (two for the wooden frame). This kayak is 500cm/16’4″ long, 67cm/2ft wide (72/2’3″ with Stabilairs), weight 19kg/42lb, capacity 150kg/330lb. – Grand Raid 540 The largest of our folding kayaks – in terms of volume – is a serious workhorse: the established choice of multi-day wilderness expeditions worldwide. This model comes with wood frame only, and either a reinforced PVC skin or a Hypalon skin. Grand Raid 500 – top. Grand Raid 540 – front. See Nautiraid Sept 2017 for more pricing and specification information.